Everybody has even for once in a life seen little injured dogs without hind legs having to move on a platform with little wheels. It makes the angels weep, especially for a tender-hearted impressionable person. This news came from India, where a waterfowl had lost its leg. Volunteers at the Ramakrishna Mission in a Rajahmundry town have found an unusual way to help the duck. The thing is that wings make the use of crutches impossible. That’s why the volunteers connected to a startup company 3Ding to try and produce a 3D-printed replacement leg. 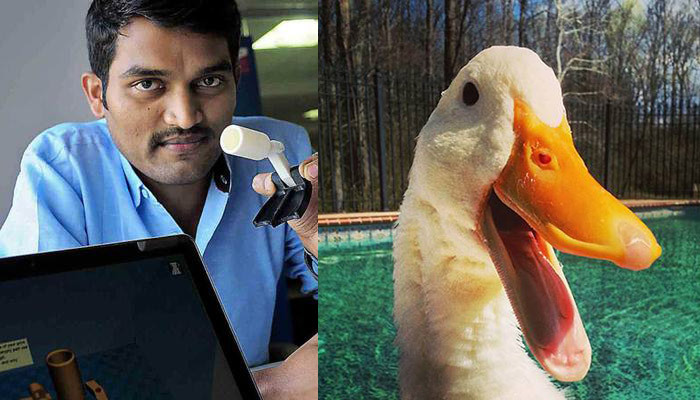 The team leader of the 3Ding Sandeep Reddy asked for dimensions and photos of the duck so that he could design a leg with flexible joints allowing the duck to move with ease and support itself while at rest. The created 3D model was printed on a 3D printer from ABS plastic. The job took about 2 hours, and the ready prosthetic is hoped to serve the duck during the lifetime. The designers made the model available on the Internet and say that they want to work in this direction and could create different aid devices for other injured animals including dogs helping them to improve their lives. Maybe the implementing of the 3Ding inventions will dry sensitive pet lovers’ eyes. This entry was posted on Tuesday, December 22nd, 2015 at 3:08 am	and is filed under 3D, printing, technology. "New Toshiba Wireless Thermal Barcode Printer Line"
"Samsung’s New Apps For Office Use"